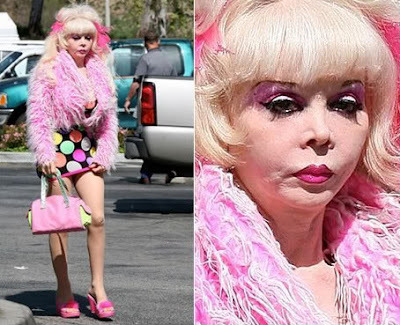 Ladies and gentlemen of the jury, please turn your attention to today's plastic surgery victim, Ms. Angelyne, shes an American model and local Hollywood quasi icon, known for her self-advertising method via giant billboards in the Los Angeles area. And while she is virtually unknown outside of her natural habitat (Hollywood), Angelyne has gained wider attention for her interesting plastic surgery makeover, with a presumed personal goal of becoming "Barbie-like". Angelyne is believed to have undergone multiple plastic surgery procedures, including breast implants (perhaps more than one), facelift(s), nose job and facial fillers. Does she think she is Barbie? She's been duped! More like barbies drug overdosed grandma! It's Doink the clown. It's really not plastic surgery.